Would Martin Luther King, Jr. Support Republican Party? On I-95 in the northbound lane, but south of Richmond, VA, there is a billboard stating “Martin Luther King, Jr. was a Republican.” It is an advertisement by the National Black Republican Association which may be a subliminal message that maybe MLK would probably vote for McCain or that his support would be for the Republican Party. Back on October 19, 1960, just one month shy of the Presidential election of John F. Kennedy (D) v. Richard Nixon (R), Martin Luther King was arrested at an Atlanta sit-in and would be imprisoned on various charges for five days. Democratic nominee, John F. Kennedy intervened by first calling King’s wife to offer support, then applying pressure until King was released. King had deliberately avoided making political endorsements and didn’t officially back Kennedy, but his father did – switching his allegiance from Nixon in a strong statement of support. It can be assumed that gesture also switched King’s own support to the Democratic Party. 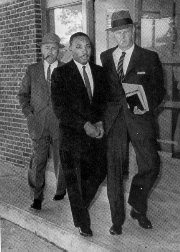 Based on King’s dream and the goal of the civil right’s movement, I am 99.9 percent sure that his support would be for the Democratic nominee, Senator Barack Obama.